"That really blew me away,"he says, remembering the scene from almost 15 years earlier. What did it reveal to him? "The Cantonese are very practical. It's a car: it's a utility, it's a vehicle, and it's a tool. The dynamic contrasts of this country are just ineffable. Unless you see it there's no picture or story that can describe it." 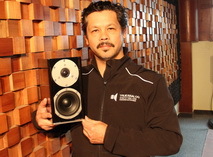 Philip, now 49, is the owner and General Manager of Trueanalog Strictly OEM/ODM, a driver and system manufacturer that he founded in 2009 to serve the international high-end and mid-fi loudspeaker industry. He owns a 19-staff factory in Panyu that became profitable in the first eight months, but describes himself as "an engineer at heart and soul." "We're scheduled to double our growth by the third quarter of next year and by that time we will have doubled the size of our factory,"he explains. His motto of "Quality, Engineering, Vision"is aptly illustrated by his constant presence on the production-line and belief that "it doesn't matter where things are made as much as who's making it and the quality control that's being emphasized on every minute process,"citing the example of Apple and Samsung's Southern China based operations. "China will be a world player and ‘Made in China' will become a sought after name." Philip was born in Long Beach California to a Filipino father and an American mother. He met his wife, Mandy, in Las Vegas and their daughter Genevieve is now nearly four years old. In 1996 he was headhunted by a very large Guangzhou-based Chinese company that brought him to the city in order to "find bumps in the production line and engineering,"which he was successful in doing. "I really enjoyed working with the people and being in China because it's so dynamic and so incredibly exciting to see things happen at such a fast rate,"he says, explaining that what would normally take months or even years to do in the United States could be achieved here in a matter of weeks, "without the bureaucracy and at incredibly low costs." Philip describes another event from around the same time that has left a lasting impression on him. "I was on the production line and I needed a part to be modified fairly quickly. The production manager, the QC manager, and the purchasing manager came down the production line with me and my fellow engineers. I said this is what I need. I have to stop production until I get it. "About six hours later I had about 12 hundred widgets that I needed machined out and put in my hand. So what they did was they stopped their machining and they machined it in-house, and they made it for me. Wow, I said, Ok, I'm sold. It still brings tears to my eyes. "He knew then that the Cantonese were not only hungry for business but practical as well. "They just get it done." Philip explains that his very first time in Guangzhou in 1996 "reminded me of a Bruce Lee movie,"describing his arrival at the old airport in the middle of the city and how far things have come since then. "By contrast the Philippines is still the same, they're not even close to experiencing growth like here. "He praises Guangzhou and Guangdong for its incredible universities, professors and consultant companies. Like many foreigners, Philip is fond of the Cantonese food. "The best food in China is located in Guangdong and the best food in Guangdong is located in Panyu,"he says, though admits to a love affair with Sichuan cuisine because of the spice and the different hues reminding him of "the different tones in sound." As far as Cantonese food is concerned, his favorite breakfast is ‘shourouzhou' which he describes as a "very lean congee with pork and ginger,"and explains how he dips in sticks of ‘youtiao,' a deep-fried bread. He also enjoys steamed buns called ‘roubao' that have a meat filling. "For dinner you can't beat the Cantonese steamed fish. It's a large freshwater fish that is steamed and then they put soy sauce over it with shredded onion and ginger as well. It's very fresh and you just pull it off with your chopsticks." In his free time, Philip is an avid cyclist and key member of GZ Cycle, "Guangzhou's first international cycling group,"that meet every weekend in the University Town. "Our company uniform is made by a cycling factory that makes clothing for the Tour de France. My company jacket is modeled after it. In the spirit of cycling I put the number on, and '09 is the year that my daughter was born." Has Philip looked ahead to retirement? "10 years is my exit strategy,"he says without hesitation, listing Germany, Southern Italy and Taiwan as possible places where he'd like to retire. "Somewhere on the beach." But the likelihood is no matter where Philip chooses to spend his retirement, China, and in particular Guangzhou, will always hold a special place in his heart and the fond memories of his time here, both in business and in leisure, will always be his to treasure. Indeed, it may well be Philip who one day in his retirement stands on a small plot of farmland tilling the earth with a sports car parked up alongside. That, however, remains to be seen -- as does the availability of water buffalo in Germany, Taiwan and Southern Italy necessary to complete the picture.